The frequency of my reports on the Chinese Yuan is admittedly much higher than it used to be. Why? Call it disbelief. More than two months have passed since China revalued its currency, and after a rapid 1% appreciation, the RMB has actually fallen back. Today, it stands only .5% higher against the Dollar compared to June 18. On a trade-weighted basis, it is actually 2.3% lower. What is going on?! It can foremost be attributed to a disconnect between Chinese words and Chinese action. While The People’s Bank of China (PBOC) purportedly supports a stronger, flexible Yuan (“Adopting a more flexible exchange-rate regime serves China’s long-term interests as the benefits…far exceed the cost in reorganising industries and removing outdated capacities.”), in practice, it has prevented the currency from budging. On numerous occasions since supposedly allowing the RMB to appreciate, it has intervened in the forex markets through various shadow dealers to prevent this very outcome. 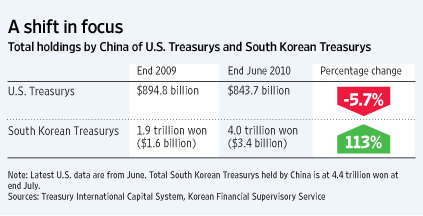 In fact, China has increased its purchases of South Korean and Japanese sovereign debt, ostensibly as part of its diversification strategy, but more likely to put upward pressure on those currencies. “Data from Japan’s Ministry of Finance show that China bought a net 1.73 trillion yen ($20.3 billion) of Japanese government bonds in the first half of this year, compared with a net sale of 5.9 billion yen ($69 million) a year earlier. That strong demand has been a key factor strengthening the yen in recent weeks.” This could have broad implications, since in the last quarter, China accumulated $81 Billion in new forex reserves, and seems intent on further diversifying out of US Dollar-denominated assets. China’s general obstinacy towards in dealing with the Yuan is baffling to market observers, especially given the trade surplus of nearly $30 Billion in June, its largest since January of 2009. In fact, China can be seen moving backwards. It recently inaugurated a pilot program that will allow exporters to hold offshore accounts of foreign currency, which might be expected to relieve some of the upward pressure on both the Yuan and on China’s foreign exchange reserves: “If you don’t force firms to surrender their foreign-exchange proceeds, then they won’t be exchanged for renminbi, which is a source of appreciation pressure.” In this way, China can both limit speculative capital inflows (even by domestic investors) and inflation. Foreign governments, led by the US, are still threatening action. Senators and Congressmen continue to harp on the issue (it is election season, after all), and are still threatening to slap a tariff on all Chinese imports. However, their efforts are being undermined by both the Department of Treasury (which refuses to label China a “currency manipulator”) and the Department of Commerce, which recently determined that the application of a broad-based tariff on all Chinese imports would violate its mandate. I have always been cynical about China’s forex policy, on the basis that it is self-interested and disingenuous, and I think the fact that it remains pegged to the USD confirms that sentiment. In the end, China won’t bow to international pressure. It will only allow the Yuan to appreciate after it has determined that its economy won’t be negatively impacted, and even then, the pace will be glacial.